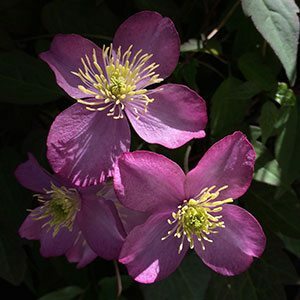 Clematis montana | An Easy Care Clematis | Nurseries Online. 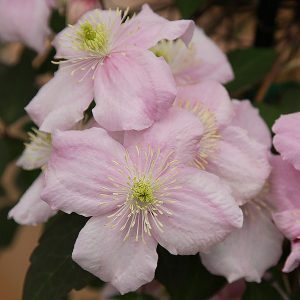 With good fragrance and attractive flowers in spring, Clematis montana is an easy care deciduous climber. It does have a vigorous growth habit and a number of named varieties are available for sale. Flowers colour ranges from pure white through to deep pink. Nearly all are fragrant and most will reach from 5 to 7 cm across, some larger. C. montana is an easy care plant that can be used to grow on a trellis, cover a fence, or left to wind its way through taller trees and shrubs. It is a fast growing plant, while it is still very easy to prune. Best planted in a sunny position, however with the root system in shade. A humus rich well drained soil is best. The time to plant is in autumn, however spring planting works well as long as you maintain moisture through the first summer. Amend the soil if needed by digging in some well rotted compost and aged cow manure, a little blood and bone can be added as well. Plant C.montana, in a position where it has something to climb on, water in and lightly mulch around the plant. Best pruned after flowering. Start by removing any dead or weak growth. Some of the older growth should also be removed to maintain size and shape. A little light pruning can be carried out at any time of year to maintain shape. Remember that flowering is on the previous seasons growth, so heavy late pruning will inhibit flowering. Soil – Humus rich, moist well drained. Position – Root system in shade or at least well mulched. The plant should grow up into the sun. Pruning – Immediately after flowering. Fertiliser – Top dress with compost and manure, or use a general purpose, slow release type fertiliser in spring. C. montana alba – White fragrant flowers to 5cm. C. montana Elizabeth – Pale pink flowers to 6 cm, taller growing to 8 – 10 metres. C. montana Mayleen – Mid pink single flowers to 5cm, fragrant. C. montana alba plena Starlight – Double White flowers with a good fragrance. 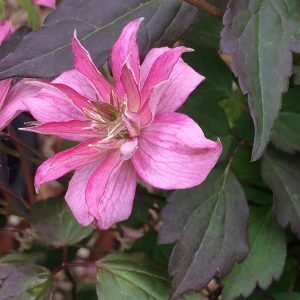 Clematis montana varieties are available for sale from the following nurseries.